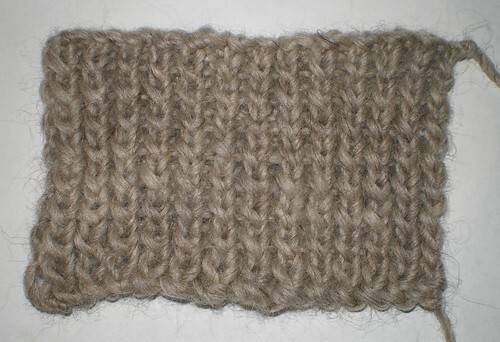 1×1 Twisted Ribbing, originally uploaded by expknitter. Comments: A variation of 1×1 ribbing, wherein each k st is k tbl on right side and each p is p tbl on wrong side. This looks like a regular 1 x 1 ribbing and the one below looks like the 1 x 1 twisted ribbing. Emma in Seattle: I think I see the crossover “X” at the bottom of the knit stitches in this swatch. It is a tad difficult to discern because of the weight and slight curl in the yarn but it is definitely there. To me, it looks like she twisted her knits on the right side, but did not twist the purls on the wrong side– thus 1/2 twisted rib. I agree completely with Deb above–this sample is 1/2 twisted 1 x 1 rib.